Slydale Hollow: Spare figures & imagination. In a recent bulk lot I acquired another Dr. Murdoch sr, missing his white coat & accessories (as is usually the case). But since I already have Dr & Mrs Murdoch I wondered what to do with him? Not many collectors want a figure with things missing... So I decided to get creative. 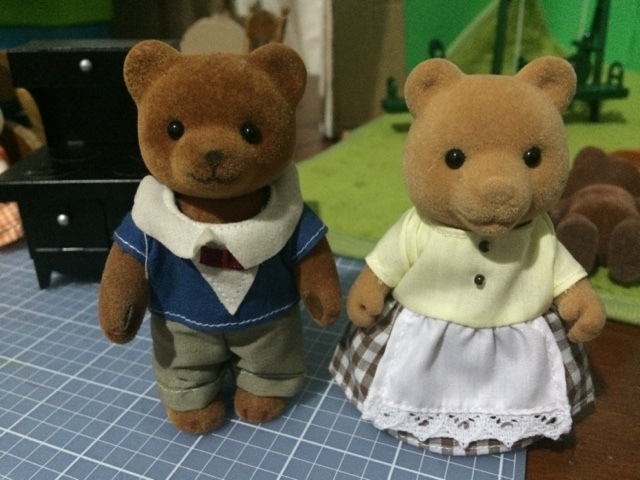 I had a Teddy Bear Story figure without clothes, & I also had a spare dress the perfect size. Now meet "Murcott" & "Miss Iris Honeydew"
I don't know what the back story will be for either of these characters, but for now I'm happy they know who they are. What a great idea! The figures look good together. They look perfect.I love the Teddy Bear Story figure. He looks very sweet. Me too! I figured those clothes are very similar to original TBS ones. Aww- sweet. I have a soft spot for wounded/ left out Sylvanians that have lost their belongings. It makes me wonder what may have happened to them on their travels! ?